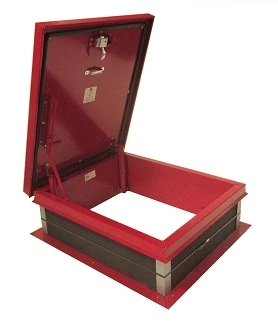 PRODUCT: RHGI-5RH, Roof Access Hatch, 48 wide x 48 inch opening, RED color Powder Coat Finish over 14 Gauge Galvanized Steel, Self-Flashing Base. Price/Each. CROSS REFERENCE HATCHES: Bilco model F-40 galvanized steel, Acralight model S-RH-4848, Milcor model M-7 / RB-4X4, Babcock Davis BRHPG48X48S1T.